I don’t know about you, but fall has totally arrived at my house and with it a big craving for pumpkin goodies. 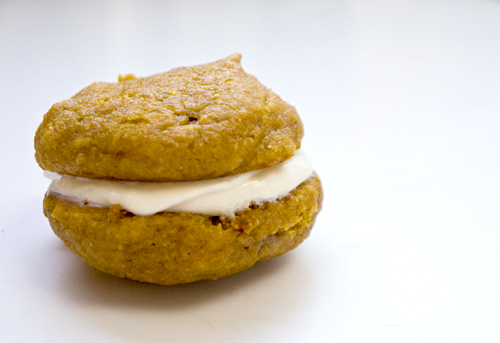 While searching around for something fun to make, I came across a recipe for pumpkin whoopie pies that inspired me. But I wanted to put my own spin on things and maybe healthy them up a bit. We love plain yogurt at our house and always have a ton of it around. With a bit of patience, I knew I could turn that yogurt into a fluffy, delicate filling for a couple of flavorful pumpkin cakes with a bit less sugar and butter than the other recipes called for. The results were totally fantastic. Start by prepping your yogurt. Really, you can’t rush this step, so just succumb to the fact you can’t saunter into your kitchen right now and make these tasty goodies. Seriously, you’ll be thinking about tossing these babies together all night, which will make them even tastier tomorrow. So place your yogurt in the paper towel lined colander, put it in the fridge, and go hang out on Pinterest or something. The next day that yogurt will have released lots of liquid and have a similar texture to cream cheese. If you’re there, it’s time to make some pumpkin cakes! Place the pumpkin puree, maple syrup, vanilla, ginger, egg, vegetable oil, and brown sugar in a big mixing bowl and whisk until everything is all happy. Now you can add the salt, baking soda and baking powder, along with the flours, and mix everything together. Heat up your oven to 350 F and line your baking trays with parchment or give them a light oil. Once your oven is ready, spoon your batter on the pans in 2-inch rounds. If you want mega-huge whoopie pies, go crazy. But, I found the smaller ones were lovely and didn’t make you feel all guilty after devouring one. Place the rounds in the oven and bake for 12 minutes – give or take. When you see the tops of the cookie/cakes turning brown and cracking, it’s time to pull them. LET THEM COOL BEFORE THE NEXT STEP. While your cakes are cooling, whip together the filling by placing your now strained yogurt in a small mixing bowl, adding the vanilla, sugar, and butter, and fluffing with a hand mixer. Sure, you could use a knife to slather that filling between two cakes, but it’s so much more fun to use a pastry bag. What? No pastry bag? Yeah, I don’t have one either. But, a nice plastic baggie does wonders! Spoon that filling into a plastic bag, squeeze everything to one corner, and snip the end (just a little bit) with a scissors. Voilà! Pastry bag! Grab a (COOL) cookie and swirl on some filling. Simply top with another cookie and eat. This recipe makes about 20+ finished pumpkin whoopie pies, depending on how big you make your cakes. Don’t expect them to last…. *Don’t feel like going through all that yogurt-straining work? Pick up a container of cream cheese frosting and pretend you made it yourself. These look amazing, but I wish I could make them right now! I suppose I’ll have to wait and strain the yogurt. Something to look forward to! Yeah, the straining of the yogurt is a bit of a pain – you could always use cream cheese frosting if you can’t wait! Oh wow! I am on a big pumpkin kick lately, I cannot wait to try these! Mmmmmmn, these were delicious as promised!! The entire family loved the cream that had a fabulous tanginess we all loved. So easy though waiting all night to strain the yogurt did test my patience…. One question, how do you store them? I put them in the fridge loosly wrapped and they became soggy and less appetizing, though everyone still wolfed them down the next day. wondering if you have a better suggestion? Karen – I’m so happy you liked them! The whole wheat flour gives the pies a bit of hearty-ness, which is super beneficial in keeping everyone from eating them all in one sitting! I found popping them in a plastic zip top bag with a sheet of paper towel between them helped the whoopies from getting gooey, but did cause some bits of the cakes to get stuck to the paper. Didn’t stop us from eating them all either!